I was torn between mirth and anger after reading Gov. 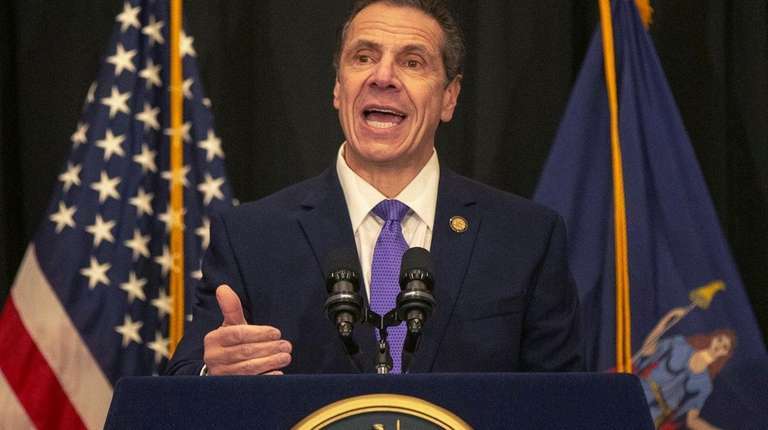 Andrew M. Cuomo’s remarks that new federal tax laws are, in part, leading high-wage earners to leave the state [“$2.8 billion state tax shortfall,” News, Feb. 5]. Where has the governor been? Residents have been leaving for years because New York is one of the highest-taxed states in the nation. Unless you have a decent pension, it is very difficult to retire here. Of course, the governor found his reliable patsy in Donald Trump, as though the president is responsible for New York being one of the highest-taxed states in the country. Maybe New York’s philosophy of tax, spend and spend more will finally come to an end. I find it interesting that days after Gov. Andrew M. Cuomo noted that some people are changing their residency from New York to avoid paying higher taxes because of the cap on the federal deduction on state and local taxes, he comes up with a plan to raise commuter tolls, essentially a tax [“Gov: ‘Crisis’ demands congestion pricing,” News, Feb. 8]. Slow learner? He wants more people to leave? He doesn’t get how devastating transportation costs already are on New York workers? Nobody cares if the taxes or tolls are in a lockbox. New Yorkers already are heavily overtaxed. President Donald Trump gave me what I expected to hear in the State of the Union address: a lot of grandiose claims and promises but little substance [“State of the Union vow: Build barrier, boost economy,” News, Jan. 6]. The Democrats’ response was pathetically weak. Georgia politician Stacey Abrams spoke in generalities and did not address Trump point by point. If she is any indication of the kind of leader the Democrats might run for the White House in 2020, then I’m afraid we are faced with more years of Trump. I give President Donald Trump credit for offering a few poignant heartfelt moments highlighting the fight against childhood cancer, honoring patriotic military service and saluting women’s gains in Congress and the workforce. But his state of dis-union offered more of the same partisan posturing. He uttered empty words to promote unity, but did not honor the diversity of all people, races, creeds or genders. His fearmongering about immigrants creates a wall of division. A reader wrote that expertise in a subject is all it takes to be a short-term substitute teacher [“Pay for substitute teachers is pitiful,” Letters, Feb. 7]. He is so wrong. I took two classes, one in Hebrew and one in Photoshop, with two experts who had never taught. While they knew their subjects, they had no clue as to what students needed. Their pacing was off, they covered too much material in a short time and they left no time for practice. I have taught as an adjunct at Queensborough Community College and am a former high school teacher. I covered many classes for professors who are far more knowledgeable than I am, but I believe students got more from me because I know how to break down material to make it understandable. This ability comes from education training. PhDs in physics and math are way above the level of their students, but some have difficulty understanding why their students struggle.